The rent at 55-57 Peachtree Street Apartments ranges from $1,800 for a two bedroom to a $1,800 two bedroom. Apartments in this building are about 5% less expensive than the North Central average. This is a pet-friendly apartment. This apartment is in the North Central neighborhood in Charleston. 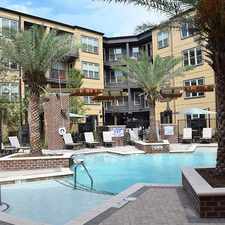 Nearby parks include College Park, Hampton Park and Johnson Hagood Memorial Stadium. 55-57 Peachtree Street Apartments has a Walk Score of 65 out of 100. This location is Somewhat Walkable so some errands can be accomplished on foot. Wagner Terrace 2 BR/1 BA | Off-Street Parking | Pet Friendly | Large Yard - Showing now! Charming 2 bedroom, 1 bath, 2nd floor apartment in quad apartment building on beautiful Peachtree street! Great rental rate for this downtown location that's less than 2 miles to College of Charleston and MUSC, just a short bike ride to historic downtown Charleston and quick access to I-26. Living at 57B Peachtree street allows you to enjoy all of the local restaurants, cafes and coffee shops that are in walking or biking distance from the property! The interior of the apartment features hardwood flooring in all rooms except the ceramic tiled bathroom, a renovated kitchen with stainless steel appliances, custom window treatments on all windows and a laundry room with a washer and dryer and extra storage. Reserved off-street parking is available for two vehicles plus plenty of on street parking. Pets are negotiable, dog breeds are restricted. The building is situated on a double lot with a large and lushly landscaped un-fenced yard. The Landlord takes care of yard maintenance and exterior pest control. Explore how far you can travel by car, bus, bike and foot from 55-57 Peachtree Street Apartments. 55-57 Peachtree Street Apartments has some transit which means a few nearby public transportation options. 55-57 Peachtree Street Apartments is in the North Central neighborhood. North Central is the 9th most walkable neighborhood in Charleston with a neighborhood Walk Score of 74.